To kick off a Grizzly Bear Week of exclusive content at DiS we've some gastronomic delights to bring you, courtesy of drummer Christopher Bear. If you've always wondered what gumbo tastes like but never actually tried it, then this is a pretty good place to start. One of my favourite parts of getting out of town with the band for rehearsing or recording is all the cooking we do. I think it was the first trip that me and Edward took for the Veckatimest writing process where this recipe was developed. There were a lot of random demo ideas from the trip, but really the only things that stuck were 'Two Weeks' and this gumbo. 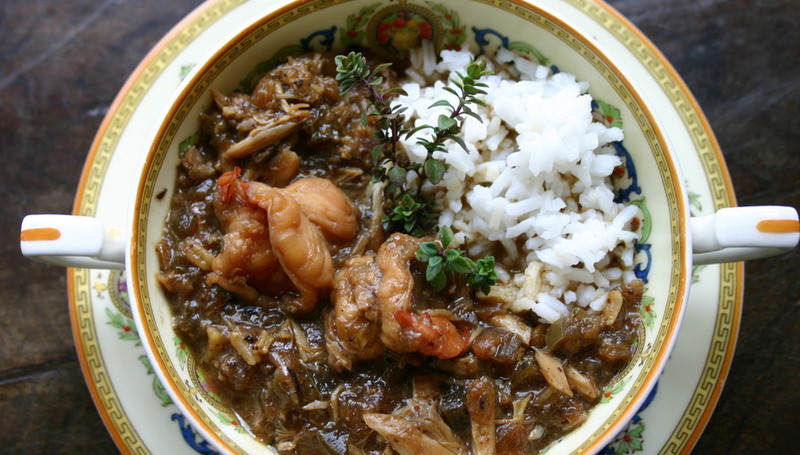 Now this recipe is by no means exact and definitely not a 'traditional' gumbo. I'd say it falls somewhere between gumbo and a caicucco (mediterranean seafood stew). It's important to keep tasting as you let it simmer to see if it needs any other touches...we got pretty experimental with it. Also, this recipe makes a pretty enormous amount of gumbo. It was great for us because we'd have it for dinner one night and then lunch for the next few days. At this point it feels like tradition to make gumbo the first night of any recording/rehearsing/writing retreat we take. It can be expensive and time consuming, but it is well worth it when you have a week supply of delicious, spicy gumbo. Enjoy!!!! Peel shells off the shrimp and add to about 10 - 12 cups of water. Bring water to a boil and keep under heat to create a shrimp stock. Meanwhile, chop vegetables and set aside. Begin making a roux by heating peanut oil in a small pot and gradually whisking in flour. Continue whisking the flour and oil under heat until it turns a golden brown. Add onion and celery into the roux and mix until they soften a bit. Transfer roux, onion, and celery into a larger pot and add rest of vegetables. Strain shrimp stock and add into the pot with the roux and vegetables. Add the canned tomatoes, the chopped herbs, and other spices. Add squeezed lemon juice and red wine vinegar. At this point, the optional whiskey, bitters, and can of beer can be added. Add salt to taste and keep under heat to let it reduce. Add crab meat and broken up fish fillets first... add shrimp and scallops once the rice is simmering. Bring 2.75 cups of water to a boil; stir in rice and saffron. Reduce heat, cover the pot, and let rice simmer for about 15 minutes. Serve the gumbo over rice and garnish with chopped parsley, chopped scallions, dollop of sour cream, and hot sauce. Stay tuned to DiS throughout the week for much more ursine content from the Bears. Veckatimest is out this week. You can read our 9/10 review here.